The staffing levels have fallen to new lows in recent years. More Tucsonans have been coming forward with complaints about officer response times. 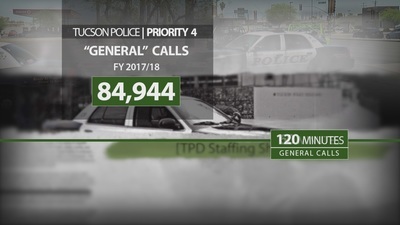 KGUN 9's Investigative Reporter Valerie Cavazos looked into what's expected of the Tucson Police Department and how long should it take? 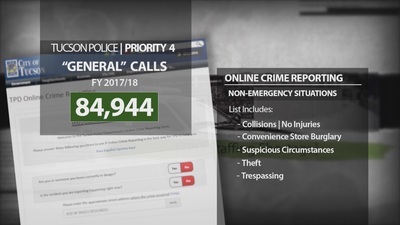 The 9-1-1 calls of crimes in progress -- life threatening -- are put at the top of the priority list. About 2,300 calls expected this year -- more than double the amount from 2012. City of Tucson data shows an average response time of five minutes reached 72 percent of the time. TPD Uunion Leader Sgt. Jobe Dickinson says, "If someone calls and it's a priority 1 call, there's imminent threat -- bodily injury or death -- we are getting to those calls. Now are we getting to them as fast as I would want us to -- no. I think we could do better." City of Tucson data shows an average response time of 5 minutes reached 72 percent of the time. Critical 9-1-1 calls, when there's some danger present, swells dramatically to 43,712 calls a year - on average. Response time goals -- 10 minutes -- is reached 60 percent of the time. But it's the response to the lower levels of "urgent" and "general" calls that's receiving criticism. It amounts to nearly 161,000 -- or 78 percent of all 9-1-1 calls. 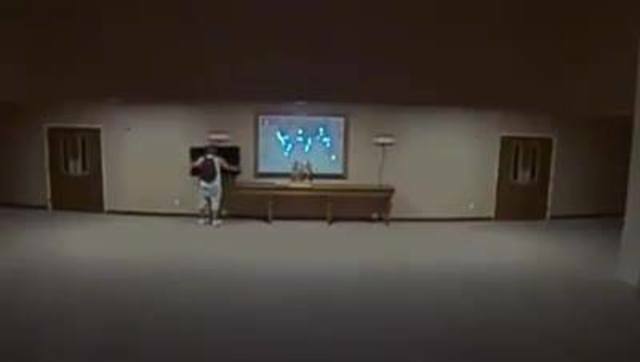 Repeated 9-1-1 calls after two recent break-ins at Tucson Baptist Church fell into that general "quality of life" net. 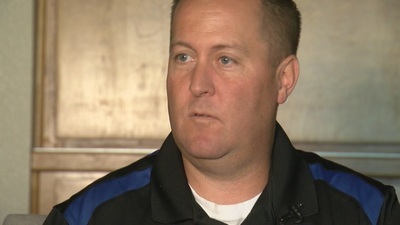 Pastor Brent Armstrong tells KGUN9 both response times exceeded 5 hours. "We called 911 and they said thank you, we'll be there as soon as possible," he said. Sgt. Dickinson says, "If your car gets stolen or somebody breaks into your house and steals items, the amount of resources that we have to put into those are nowhere near where I would expect them to be and where I expect the community to expect them to be." 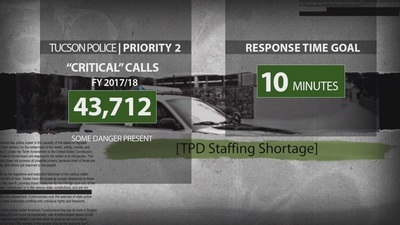 More than a decade ago, TPD set a timeline for officers to respond within 60 minutes. "I can say that while it's not perfect, it's acceptable," said Dickinson. Now the timeline has moved to 120 minutes -- 2 hours -- and data shows that goal on average is met 66 percent of the time. "Now you're having to wait two hours and we're not meeting that 2 hour goal? How far are we missing it? That's unacceptable," said Dickinson..
Armstrong said, "Effective leadership requires communications so if you're going to communicate It's going to be 60 minutes, It should be 60 minutes. If it's going to be 2 hours. Then it needs to be 2 hours." The response to the lower levels "urgent"and "general" calls is receiving criticism. Those types of calls amount to nearly 161,000 -- or 78 percent of all 9-1-1 calls. 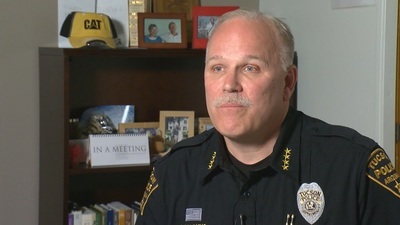 Police Chief Chris Magnus says TPD is meeting most demands. "Are these things ideal if your expectation is an officer for everything? I get it. They're not. Are they still good quality service when our goal is to have an officer that can continue to make it to those emergency calls within five minutes," he said. Magnus wants citizens to rely less on police for non-emergencies so he's worked on or improved alternative solutions. Citizens can make appointments with officers at substations or they can report non-emergency crimes online. Cavazos: "So this is something that the community in general does not expect. They expect to make a 911 call." Magnus: "I appreciate that in any city in this country if you call the police, in an ideal world, it would be nice if within 30 seconds or five minutes or whatever it is, you could have an officer there. I get that. But the reality in almost every city is that choices have to be made based on the resources that are available."